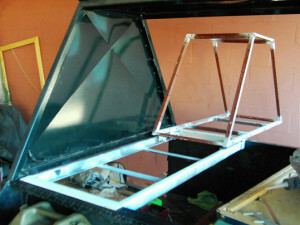 The trailer fitout began by building a roll out cupboard. The tradesman-like shape of the canopy on the trailer meant a little more work when constructing the roll-out out cupboard to fit and contour with the shape. The size and weight of the cupboard also meant the slide assembly needed to be very robust. 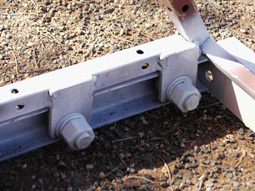 This was achieved by using a section of c-channel as runner guides and wheel bearings as the rollers. Between the bearing surface and channel I riveted a 3mm strip of polyurethane, avoiding metal-to-metal contact and providing a smoother, quieter roll out. The finished cupboard has a large cutlery draw, and large storage area above with horizontally hinged door flap. In building the slide out kitchen I used heavy duty Accuride stainless steel telescopic slides (carrying up 120kgs) to ensure that the kitchen stayed secure on corrugated roads. The kitchen is the full width of the trailer, and tailgate locks tight against the kitchen to prevent any movement. There is one deep cupboard to hold pots and pans (even the camp oven), one cupboard under the grill and another under the sink. Two 60 litre polythene tanks slung under the trailer and encased in 3mm galvanised iron boxes ensures protection and supplies a reasonable amount of water for extended trips. The self priming 12volt Shurflo pump delivers water over the sink. Shurflo was an obvious choice as the pump employs three independent pumping chambers to pump water smoothly and quietly. It also has check valves rated to 200 psi to prevent backflow into the tank, and they can run dry without damage whilst being thermally protected. The tap protrudes from the rear of the trailer so water is always easy to get without opening the kitchen. 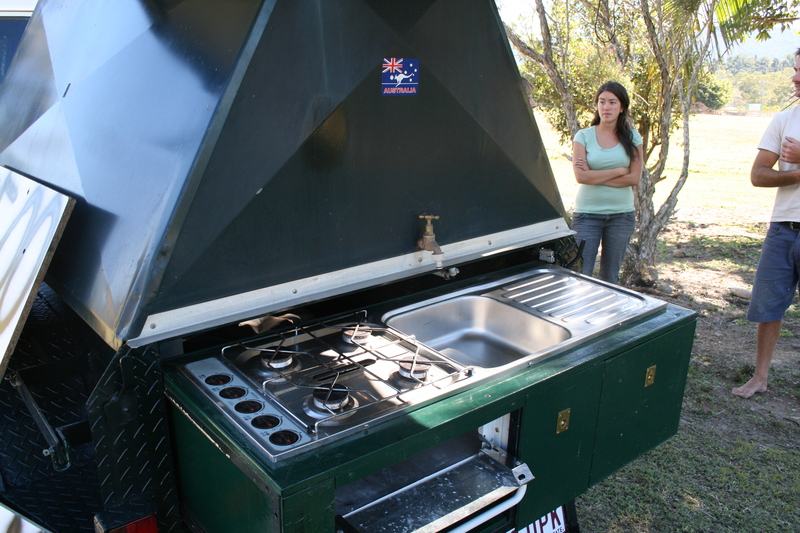 The kitchen is complete with a Spinflo combination sink and stove with grill box and gas cylinder is secured and mounted inside the trailer. 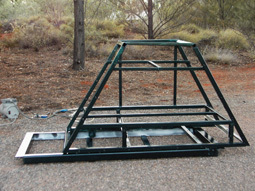 Whilst the trailer fitout is rather agricultural, the whole system is rugged and built to last. No more rummaging through boxes to find supplies. 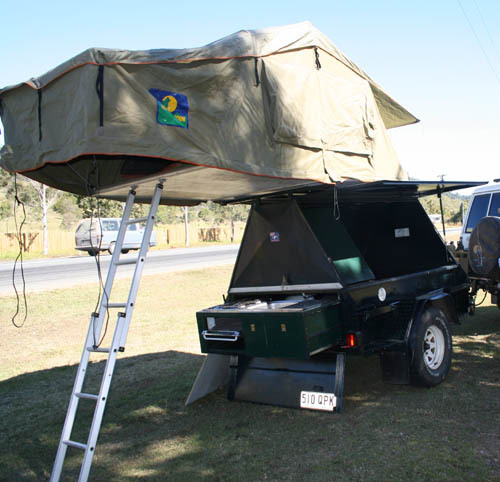 With the rooftop tent on top we can be set up with a cuppa on the boil and be ready for bed in less than five minutes!